The above info came from Moses, and was edited by yours truly (contact me). The image came from TV Tome. 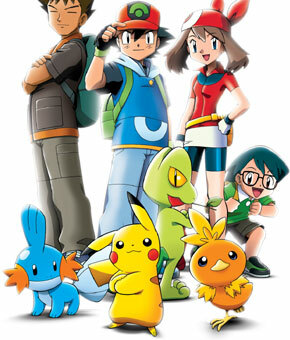 Pokemon Advanced is sixth season of the TV series, and is about Ash's continuing adventures to become a Pokemon master. In this series he joins with new characters May and Max to defeat Team Rocket and earn more badges. Ash is in the Hoen region now and seems to know much more than usual since he went from Kanto to Johto. A new professor also arrives called Professor Birch. Team Rocket is as wacky as ever in this series. Unlike Johto, every episode isn't always filler.